The F.A.S.T. 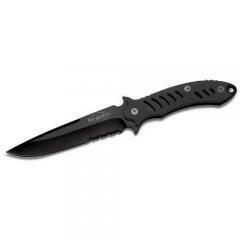 (Fast Action Soft Touch) from Remington's Sportsman Series is a large, fixed blade hunting knife with a tactical edge. The slight drop-point gives it plenty of piercing strength at the tip, while the long cutting edge is partially-serrated towards the handle for additional versatility. Its black finish prevents reflection and protects the steel from wear. Rubber coating on the steel handle provides a secure, non-slip grip. Its texturing and deep index finger groove make it highly controllable, perfect for delicate and precise tasks, and the finger guards provide protection from the blade. The F.A.S.T. comes with a rugged nylon sheath for convenient portability and storage.